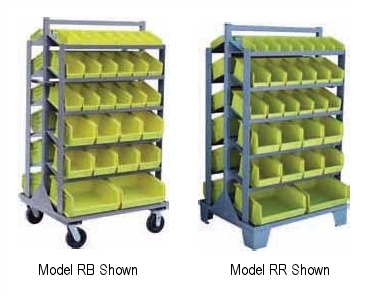 All welded construction (except casters — Model RB). 12 gauge bottom deck and caster mounts (Model RB only). 1-1/2” tubular center uprights with 3” x 3/16” thick horizontal members. 5” high legs (Model RR). Corner supports — 3” x 3/16” thick. Bolt on 6” urethane casters, 2 swivel & 2 rigid (Model RB). 14 gauge sloped shelves — 6 levels on both sides.